Maximize your work mobility with Office 365 mobile access. Office 365 improves communication and team collaboration not only in the office, but also on the go. Cloud-based Office 365 on your smartphone or tablet that support Microsoft Exchange ActiveSync enables you to feel free from your desk and be productive on the go. 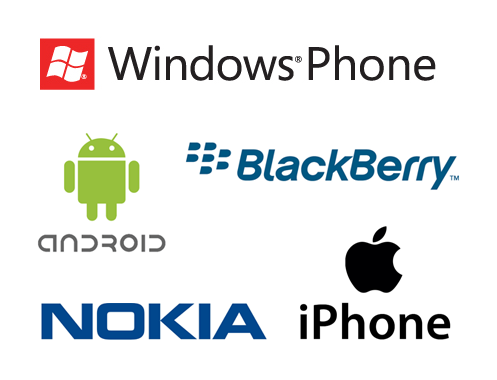 Supported on Windows Mobile, iPhone, iTouch, Android, Nokia and BlackBerry phones. The main advantages of Office 365 is that email, calendar, contacts are synchronized on all devices all the time. Even on the road the user can easily access any company contacts and team schedules. OneDrive for Business (formerly SkyDrive Pro) library available with SharePoint and Office 365, allows you to store documents and media files in a secure location on the cloud. All or selected documents stored in SharePoint libraries can be synchronized instantly with OneDrive for Business application on your computer and mobile devices for offline editing. By using OneDrive via browser on mobile device, the user can view, edit and share documents via the smartphone. OneDrive for Business app on a smartphone also allows you to access, review and edit documents offline. This gives a whole new level of mobility and productivity to employees everywhere. Stay connected on the go. 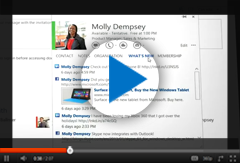 Access Outlook on mobile devices. Instant messaging, audio/video communication via smartphone. Microsoft Exchange ActiveSync provides synchronization of mailbox data between Exchange Online and mobile device. This enables access of email, calendar, contacts and tasks on your smartphone virtually from anywhere. By using Office 365 you can receive email on your smartphone as soon as it arrives to your inbox. You can also schedule to edit and respond to meeting requests, that will be synchronised with your Outlook and Outlook Web App. If you think it is now common to have email on your phone, please remember that Office 365 allows you to have email connected to your schedule, group calendars, appointments, tasks and helps you stay organized and up to date. Another advantage of Office 365 is Instant Messaging using Lync. Lync 2013 mobile apps for Windows Phone, iPad, iPhone and Android has the ability to participate in video conferences. Apart from that iPad users can view a shared desktop and application content during the Lync meeting. With Lync Mobile App users have the visibility of information presented by their co-workers and their availability. Push notifications will instantly notify a user of events such as a new or missed IM invitation, voice or even video conferencing. Comparing Lync Instant Messages and ordinary text messages, the main advantage of Lync is that you can chat with multiple colleagues at the same time. 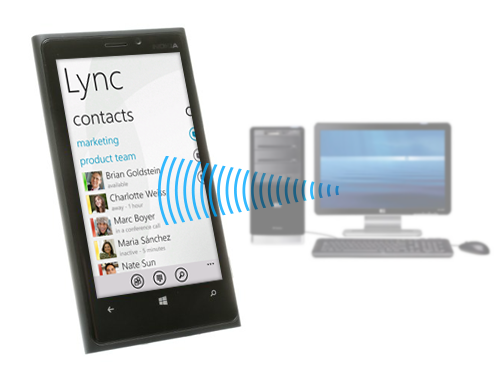 Lync apps are available for Windows Phone, iPhone, Android and Nokia (Symbian) with core IM/Presence functionality. Access, edit and view documents on your phone from anywhere. SharePoint Online allows you to access your company’s SharePoint sites, lists and documents libraries from your smartphone or tablet. With seamless access to your company’s documents you can catch up on reports or review an important presentation while you are on the go. You can also access the latest versions of your team documents when you need it, virtually from anywhere. Web browser in your mobile phone displays online documents stored in your SharePoint or OneDrive for Business (formerly SkyDrive Pro) library. Using a web browser you can view, edit and share Excel, Word, PowerPoint documents that are stored online, even if your phone does not have Microsoft Office Mobile application. Very effective is using Office 365 on a Windows Phone with Office Hub. OneDrive for Business is automatically integrated in Office Hub. While using Windows Phone you can view, edit, and share the Word, Excel, PowerPoint, and OneNote files online and offline. Office Mobile for iPad, iPhone and Android phones is free for everyone with an Office 365 subscription. It gives you a convenient access to Office Mobile applications, such as Word, Excel and PowerPoint. With Office Mobile you have ability to view and edit your files and documents on the go. Documents will look exactly how you intended in Office on PC, Mac, tablet and phone – regardless of which device you used to make the edits. Office Mobile apps are available in Apple’s App Store and Google Play for free.